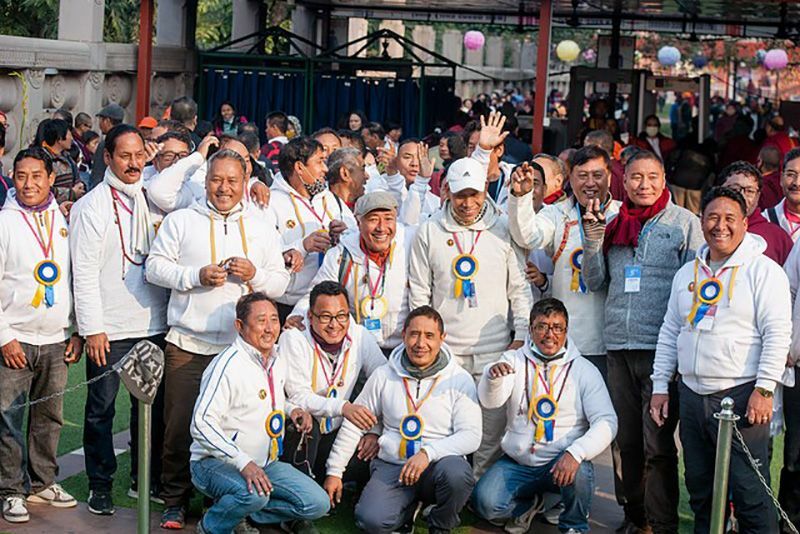 After only a few hours of sleep, rinpoches, lamas, khenpos, monks, and nuns reassembled in the Pavilion in the middle of the night to begin the third day of the Great Encampment Mahakala pujas. There was a surprising chill in the air at 2 am as they started the medium-length text, the Abridged Incinerating the Hostile. 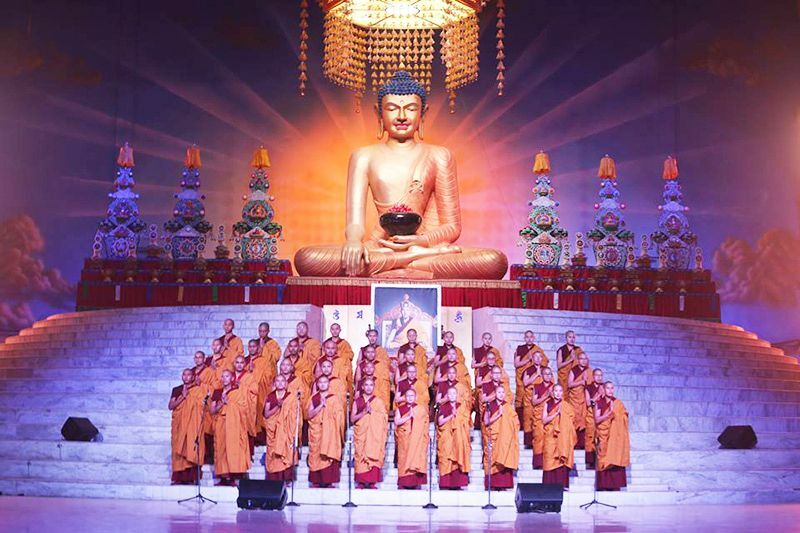 For the previous two days, the longer version of this text had been used by the main assembly, while relay teams of young monks did something else: one group chanted Mahakala’s mantra in an unbroken stream, while another sang his kangwa (prayer for fulfillment of impaired samaya) over and over. Chanting continuously in this way throughout the breaks and overnight, the two teams of young monks performed the task assigned to them by the dorje lopon (vajra master). Incidentally, the Mahakala text used today is more commonly known as The Ritual of Mending and Supplication (bsKang gsol), and is one of three ritual Mahakala texts being chanted this week. His Holiness the Gyalwang Karmapa, His Eminence Goshir Gyaltsab Rinpoche, Mingyur Rinpoche, and Yangsi Bokar Rinpoche, did not attend the morning sessions today. 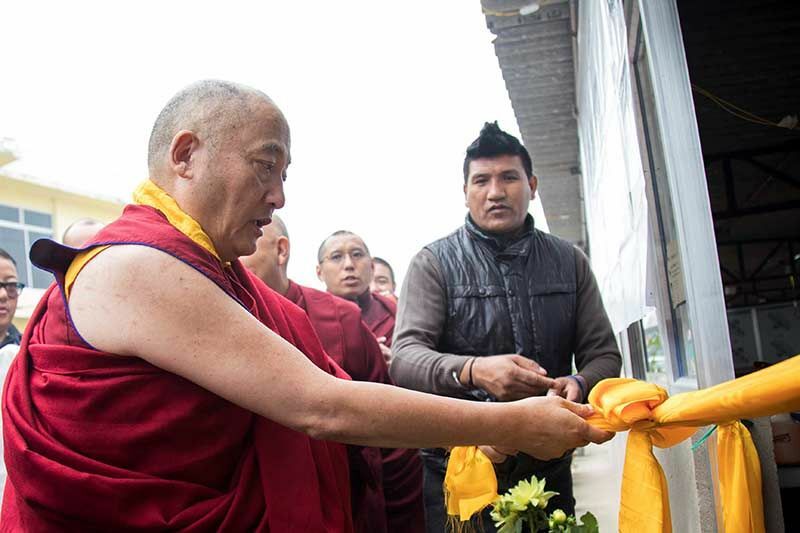 However, as soon as the puja ended at 10 am, and monks started clearing the stage, His Holiness, the Gyalwang Karmapa suddenly appeared out of nowhere and began directing the activity with great panache. Pecha tables, cushions, and thrones were quickly whisked away as sweepers arrived with brooms and pails to clean the ground for the afternoon dance performances. Finally the stage was completely clear and His Holiness thoughtfully paced the empty space giving last minute commands before leaving the site at 11:10 am. At 12:30 pm, everyone returned for the “Cham without Masks” also known as the “Costumeless Dance,” one of which was performed by His Holiness the 17th Gyalwang Karmapa, Ogyen Trinley Dorje in a special surprise performance. 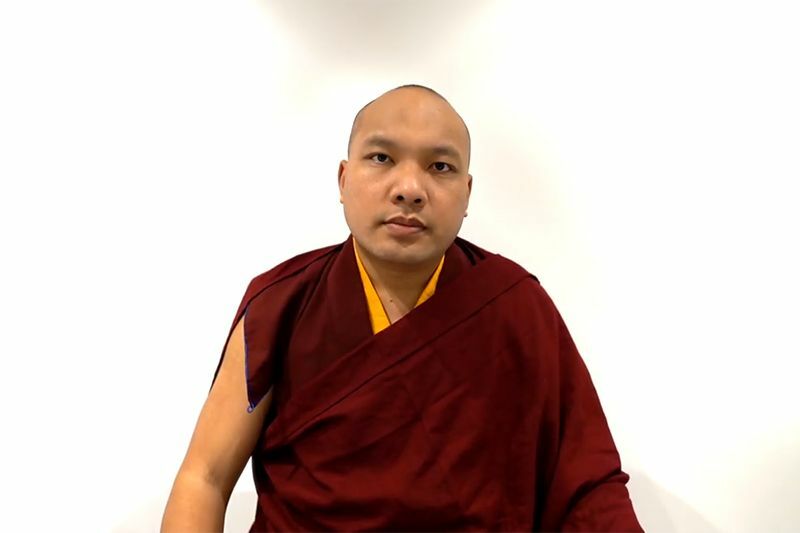 Although the Karmapa’s plan to perform the dance had not been previously announced or written in the schedule, participants were strongly encouraged to attend the “Costumeless Dance” in two enigmatic announcements made last night and this morning. This dance is usually just a dress rehearsal, but this year it has a different purpose; it is not merely a dress rehearsal, but an event in itself. 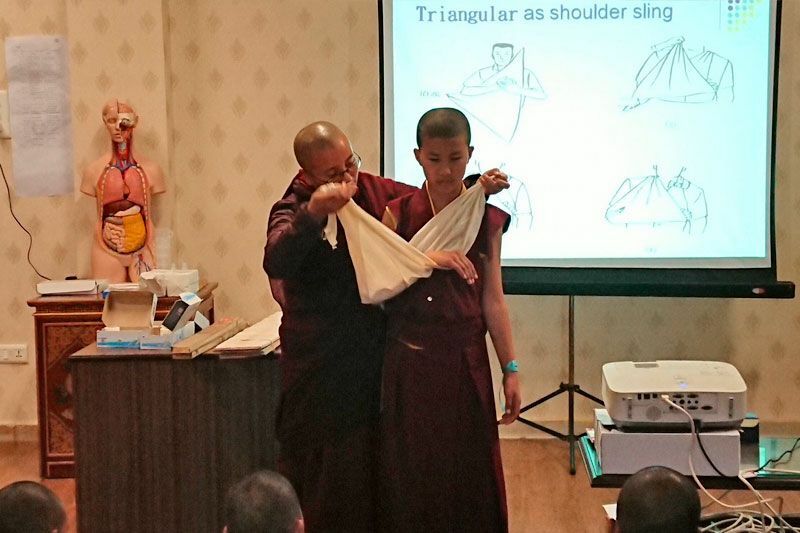 More importantly, it is considered to be a form of meditation and an offering to Mahakala Bernakchen. Also known as a dance of simple clothes, or a dance of subdued colors, at Palpung it is called the “Dance without Masks.” As to the origin of Cham in general, some say that the dances were transmitted to Buddhist masters in highly detailed visions or dreams. So this year there will be two sets of Cham dances performed, one without costumes, and one with, and both are very significant. At around 1 pm, His Holiness took his seat on the top left of the stage. Gyaltsab Rinpoche and Yangsi Bokar Rinpoche were seated to his left. Afterwards, monks from Rumtek Monastery, the Gyalwang Karmapa’s seat outside of Tibet, energetically began the dance called “Maraya.” After some time, His Holiness the Karmapa was ceremonially led onto the stage by four monks holding incense. Since his performance had not been previously announced, a wave of surprised delight rippled through the audience. For those fortunate enough to attend, this was a very special blessing. All eyes were on His Holiness as his powerful form twirled in step with the others, occasionally going down on one knee with hands waving in the air and brocade sleeves flashing. 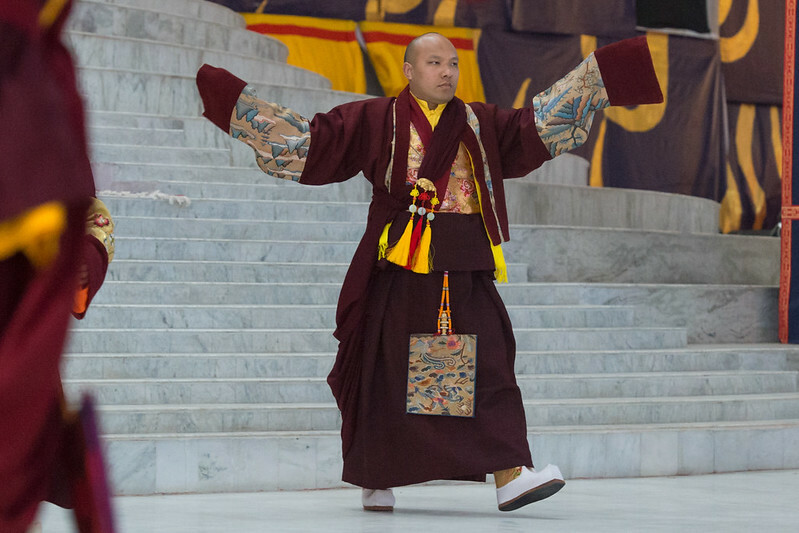 After some time, his part completed, the Karmapa exited the dance while the other dancers carried on. Then Drupon Dechen Rinpoche and several other dancers stayed on for “The Dongyema” dance that followed. After the dances were finished, the assembly, led by Goshir Gyaltsab Rinpoche, gathered once again for the fourth and final session of Day 3 of the main Mahakala puja, which concluded with a Mahakala tsok.